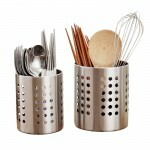 Made of high-quality stainless steel, anti-corrosion and hold your wine bottle without falling. An excellent product for hold and display your cherished wines to your friends. Can be widely used at home, restaurant, bar, wedding banqueting, party etc.